Planning a party, social or special occasion? 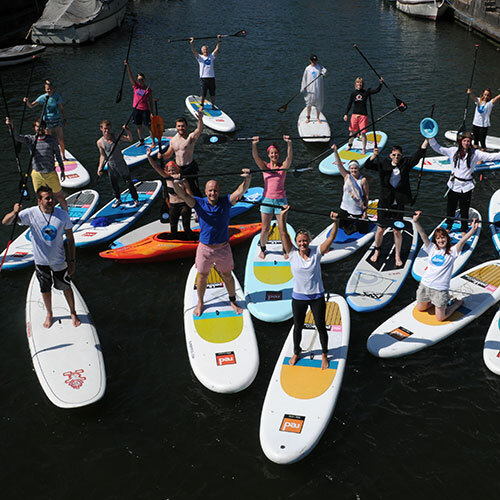 Come paddleboarding with SUP Bristol and see Bristol Floating Harbour from a brand new perspective. This is your chance to learn the basics and put them into action on an adventure through the historical waterways of Bristol Harbourside. See the sights from the water, propelled by your own paddle. Suitable for all – it’s your own session so we can make it as wet or dry as you like. Leave us a note in the notes section at checkout to help us plan your session! We can only guarantee a private session to groups of 6+ on weekends, smaller groups please book onto a harbourside adventure. Group sizes: 6–24. Please contact us to arrange larger groups. Booking: Please contact us check availability Choose to pay in full or, if booking over a month in advance, pay a £10 pp non-refundable deposit to secure your booking with the balance due two weeks before the event.